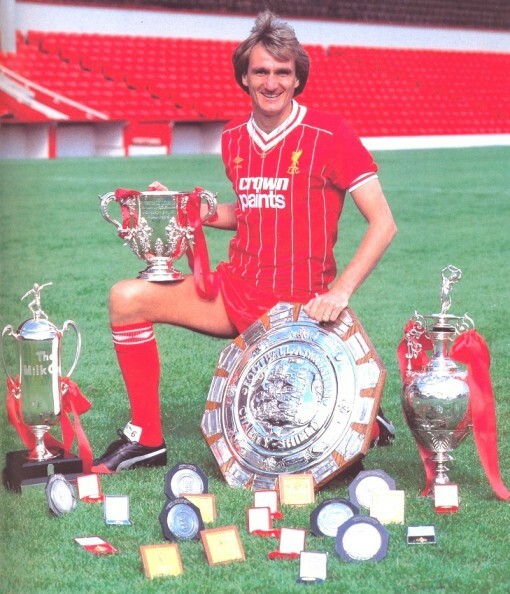 Phil Thompson - Coach of his beloved Reds - LFChistory - Stats galore for Liverpool FC! After a brilliant career at Liverpool as a player from 1971-1985 Tommo was hired as reserve coach in 1986 replacing Chris Lawler. He stayed on as coach until Souness sacked him infamously in 1993. 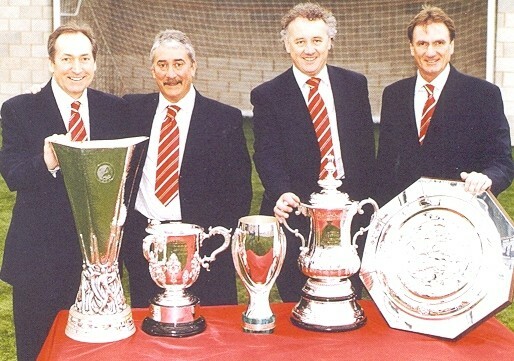 Tommo returned again to Liverpool as assistant manager in 1998. We were all training for these Masters games they have on SKY television. It was not far from the ground. All the rumours were that Roy Evans was going to be sacked. SKY television asked me to do something on it and I said no, because there had been too many people discussing his job anyway. One morning I get a phone call just out of the blue from Peter Robinson. He said: 'I'd like you to come to a meeting.' 'When?' He said: 'Right now.' Where do you want to meet? Do you want me to come to Anfield?' He said: 'No, there's too many pressmen there.' Do you know where the chairman lives?' I said: 'Yeah'. 'Can you come up there right now?' I was thinking:' 'What's going on?'. When I got up to the chairman's house they were all sitting there. It was like a funeral. Everybody sat with their heads down. My stomach was turning over with anticipation. What are they offering me here?' They said:'Phil, thanks for coming. Roy has decided that he is resigning. He wants to give Gerard the role of single manager. I said: 'Where do you see me fitting in with this?' They said: 'Well, we would like you to be assistant manager.' I felt absolutely thrilled. Imagine, assistant manager of Liverpool? It was just a dream come true. Have you ever considered managing another club? You did quite well at Liverpool as acting manager. I did very well. I took them to 2nd place, six months in charge. I always believed Gerard would be back, fit and healthy. When I left Liverpool I got a couple of offers to get back into the game. I just didn't feel my heart was there at that time. I've gone and done some media stuff at SKY and I think a lot of people look at Phil Thompson now and they know my heart is only at Liverpool. I must admit I enjoy doing my television. Everybody can remember Houllier's return to management. There was a rather funny incident that took place during the game. It was the Roma game when Houllier first came back. In the afternoon I bit into an apple and my crown in the bottom row of my teeth had come out. It was on a prong, a piece of metal stake. I just kept pushing it back in, because I had to leave it until the next day to get something done, to get it cemented. It was very very loose. It was a high pressure game we had to win 2-0. After about 10 minutes in the game I go to the touchline. And I go [whistles so loud my ears are still ringing]. My tooth went out like a rocket as I whistled. I could see where it landed. It's gone just on the pitch, probably about 6 inches inside the line. I am on my hands and knees moving the grass apart to find this tooth. Gerard yelled at me: 'Phil, what are you doing?' Get back here'. I turned round and pulled my bottom lip down and held my tooth up. Everybody just burst out laughing and Gerard was killing. The TV actually goes over when it all happened and Martin Tyler actually said: "Even in the height of the seriousness of the game, they can still laugh about it." I am in good contact with Gerard. We got on very well. He was far more educated than I was, but he realized my passion for Liverpool. My loyalty to him was immense. Throughout his illness he spoke very highly of me and I was very supportive of him. 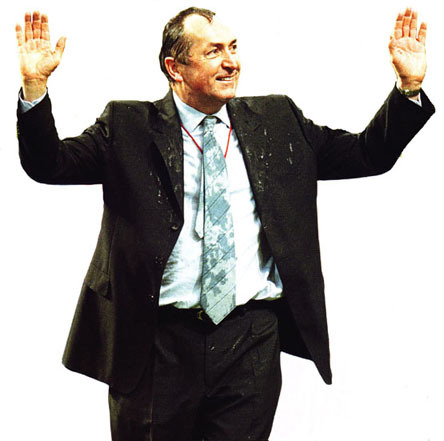 People tend to talk of Houllier as a failure. They seem to have short memories. That gets me very angry. Even in the Liverpool Echo when we finished they had: '10 million pounds of cost to get rid of us.' They had pictures of us in the newspaper like we were criminals. That was absolutely dreadful. We put the smiles back on the faces of the Liverpool fans. We had the first European final for many years. People had only heard of the legends of European finals. We beat Manchester United in the League cup. That wasn't anything to be sniffed at. We had a wonderful day down at Cardiff. Over the few years we were there we gave some fantastic times. We were going down to Cardiff on a regular basis so it wasn't a failure. We were a part of the history of the club. We came, we served, we left. The club needs to move on. If people think that we took the club as far as we can, no problem, maybe it was. Gerard nearly gave his life for Liverpool Football Club. He nearly died on the operating table. We did what we thought was right, the doctor and myself. We eased him back in. We didn't want him to come straight back either for the training or the football. We drip-fead him information and time to allow him to get involved. When he came back for the Roma game, it was a very emotional night. Now when I think back, I should have said: 'Right, you've done your duty. You wanted to make sure we got to the next stage, you go back home.' From that day he was back in straight away. Me and the doctor could have handled it a little bit better. 'You've come, go back. You can come in a couple of weeks for another game and then in another couple of weeks.' And left it until the end of the season before he could come back on full-time basis. Was there no role for you after Gerard went? The chairman and Rick said they wanted me to stay on, "but until the new manager comes in we can only assume so." I stayed at Melwood. I was taking my belongings. I thought: 'This is not right'. So I took a lot of stuff out of my office and took it home. There's a new guy coming in. He's going to want his own people. The club was very clever because me being a local boy who was very popular with the fans, they didn't want to make it look as though it was the chairman and Rick sacking me. If the new manager would want to bring in his own staff, it would make it a lot easier. That's exactly how it happened. I had a one hour meeting with Rafa Benítez. He asked me about my role, what I did and how I did it. How we prepared for games. He wrote down loads of stuff and everything. At the end of it, I said: 'Rafa, look, I don't want to be messed about here, mate. I'd rather you being honest with me and if there's nothing down for me, it's not a problem. It happens in football.' He said: 'We don't have the same roles in Spain you have here in England. I'm not sure what I'm going to do. Yes, I am going to bring in some of my own people.' I knew by the way he was speaking there was nothing down for me. I came out of there and went to Rick Parry and said: 'Rick, in my office.' I said: 'I'm not daft. I know what's going on here. I think it's best we call it a day.' Rick stumbled on his words... I said: 'Rick, it's not a problem. Don't worry about things. You have given me six great years. I'm more than happy with what I've done at the club. Let's sort out my contract and let's part ways. I'm not going to be bitter or spiteful.' I felt upset the last time when Graeme Souness sacked me because that was more personal. So we ended on good terms.